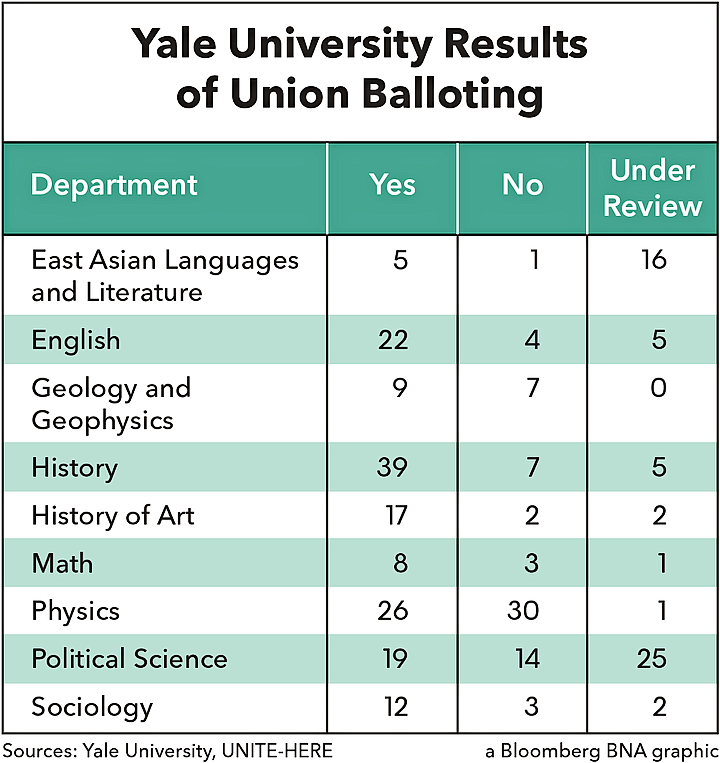 A majority of Yale University graduate students across several academic departments voted for union representation, UNITE-HERE and university representatives told Bloomberg BNA Feb. 24. The ballot count, administered by the National Labor Relations Board, took place late Feb. 23. Students in the English, geology and geophysics, history, history of art, math and sociology departments voted in favor of forming a union. The students will be represented by Local 33. The organizing effort wasn’t entirely successful. Graduate teachers in the physics department voted against union representation. The outcome of voting by students in the East Asian languages and literature and the political science departments is still unclear. Some of those ballots are under review by the NLRB. Yale University is the latest private college to have graduate students unionize after the August 2016 Columbia University decision that overturned a 12-year-old precedent on graduate assistant organizing. The students were able to vote on unionizing under the NLRB’s 2011 decision in Specialty Healthcare & Rehabilitation Center of Mobile (357 N.L.R.B. No. 83, 191 LRRM 1137 (2011)). That decision found that smaller bargaining units are appropriate if the workers constitute a readily identifiable group sharing a community of interest. Even with that strategy, the union clearly failed to win over all departments, Lynn Cooley, the graduate school of arts and sciences dean, said in a statement sent to Bloomberg BNA. “The slim margins of victory and very low vote counts in many departments only underscore the concerns many have voiced that a small number of students could be in the position to decide such an important question for everyone,” Cooley said. The university is examining the results closely and is set to respond more fully in the coming days, she said.